Create your very own driveway foam party! MTM Hydro PF22 Professional Foam Cannon is a foaming lance designed to provides the ultimate foaming car wash experience. Used with your pressure washer, the MTM Hydro PF22 Professional Foam Cannon offers adjustable fan blades AND an adjustable spray pattern, either horizontal or vertical, allowing you to make each wash just your own! Sturdily built using heavy plastic and brass, the MTM Hydro PF22 Professional Foam Cannon is a car washing game changer! 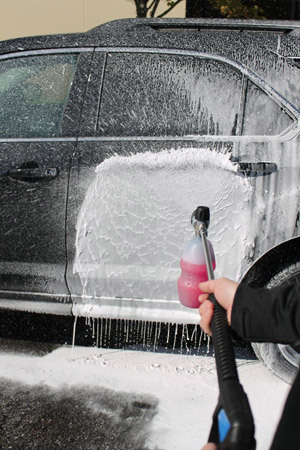 If you haven’t used a foam cannon to wash your car, now is the time! Using a foam cannon, whether you are a professional detailer or an enthusiasts keeping up with your own cars, cuts your washing time down dramatically, while also providing a safe environment in which to remove surface contaminants. MTM Hydro PF22 Professional Foam Cannons give you a huge blast of foam! When dirt, dust, and other debris are on your vehicle’s surface, even the slightest touch can scratch or mar your finish. You probably know all about using a high lubricity shampoo and a super soft washing medium for a safe dirt removal, but adding a foam cannon to the equation makes it even better! The foam provided by the MTM Hydro PF22 Professional Foam Cannon is a thick layer that fully encapsulates dirt and other debris on the surface, allowing you to remove the contaminants without harm! Aside from the safety aspect, using a foam cannon like the MTM Hydro PF22 Professional Foam Cannon cuts your car washing time like you wouldn’t believe. Instead of washing and rinsing one panel at a time, you can fully coat the vehicle in a thick foam, allow time to dwell on those tougher grime areas, and work your way around the vehicle with your wash mitt. While a bucket and Grit Guard is still necessary, using the MTM Hydro PF22 Professional Foam Cannon saves you time! And we all know, time is money! What sets the MTM Hydro PF22 Professional Foam Cannon apart from others is the adjustable foam settings never before seen in a foam cannon. Not only are you able to adjust the fan blades, but you can now adjust the spray pattern as well! MTM Hydro PF22 Professional Foam Cannon will spray thick suds both vertically and horizontally! 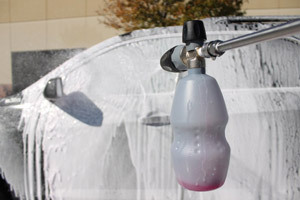 Use your MTM Hydro PF22 Professional Foam Cannon to keep your car wash safer, quick, and better yet, more fun! MTM Hydro PF22 Professional Foam Cannon comes with two commonly used fittings for your pressure washer (pictured). If the included fitting is not the fitting you need, please see the options below that can be purchased separately.